As African Safari Experts, we’ve broken down the benefits of travelling in safari high and low seasons to help you choose the right time of year for your for Big 5 vacation and the best time to see the animals. 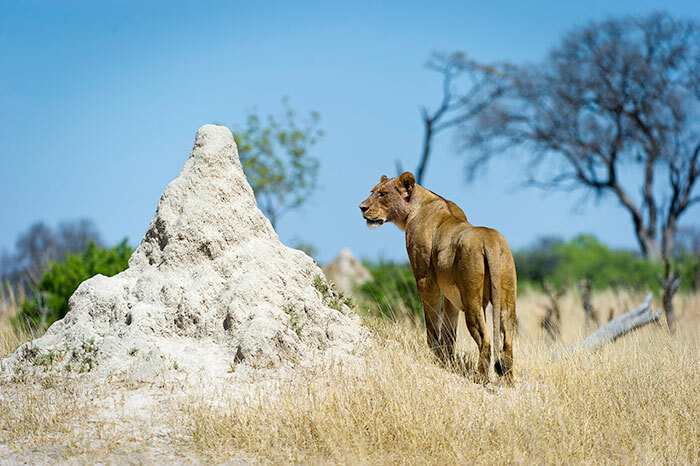 The brittle dryness of June in Zimbabwe’s Hwange National Park is a boon to this lioness as she can see and stalk her prey more easily. October in the Sabi Sand Game Reserve: very dry grass, little grazing and the animals out in the open. Africa’s winter runs from about June to October (ie northern hemisphere summer). Almost everywhere, except Cape Town, experiences a dry winter with virtually no rain. Expect cool to cold mornings and evenings with warm afternoons. It will be dry with sunny skies. Don’t be fooled: Africa can get very cold with frost in places. Morning and afternoon game drives will be very cool so dress in layers. If you are prone to feeling the cold, bring gloves, a scarf, a beanie, long trousers, a fleece jacket and closed shoes – all in browns, greens and greys. Game-drive vehicles may have hot-water bottles and blankets to keep you cosy. In South Africa, vehicles are generally totally open (without roofs) so you may experience a cool breeze while driving. Even though it is winter, bring sunglasses, a hat and eco-friendly sunscreen. The biggest advantage to travelling at this time of year is that the game is much easier to find. The vegetation thins out radically because of the lack of rain and animals don’t move far away from the remaining water sources so you can often spot them far more easily. Some animals that are nocturnal (awake at night time) in the heat of summer – like bat-eared foxes – become diurnal (awake during the day), radically improving your chances of seeing them. Female grazers – like zebras, wildebeest and antelope - are generally heavily pregnant, waiting for the summer rains and fresh grazing to arrive to drop their babies. 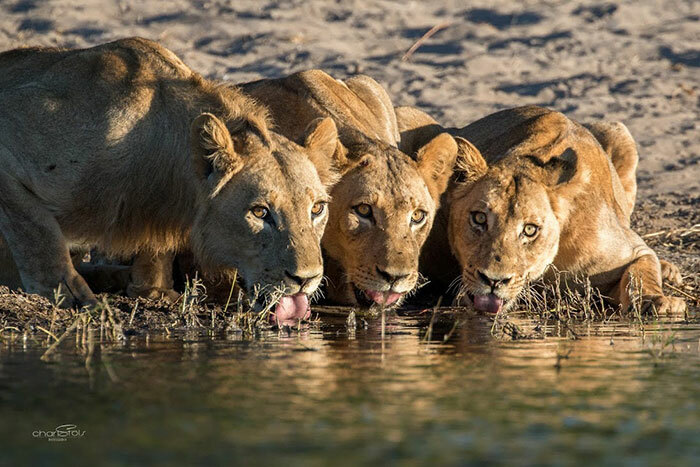 By June, rain is drying up so animals don’t move far from remaining water sources, making them easier to find like these lions at Pangolin Tented Camp in Chobe. Migratory birds fly to North Africa and Europe for the winter and grazing babies are not born (because there isn’t enough grazing or water to ensure their survival). Trees aren’t in flower and less hardy plants may dry up completely. What you also won’t see – and may not miss! – are the bugs. Insects generally go into the larval stage during the dry winter, meaning there are fewer mosquitos, ticks, flies, butterflies, ants, dragonflies and so forth about. Check with your travel clinic about malaria medication regardless of the season or destination. Fewer bugs has a downside though: insectivorous birds, reptiles (including snakes) and amphibians will be laying low and waiting for summer. Even in the Okavango Delta, you may not see frogs in peak season. By June, the waterholes around Luangwa River Camp in Zambia are getting smaller so these zebra won’t move too far away from places they know still have water. Days are cooler, there is much less humidity and no rain (meaning you may not need a camp or lodge with air conditioning or a swimming pool, which can be a big saving at peak season when rates are higher). 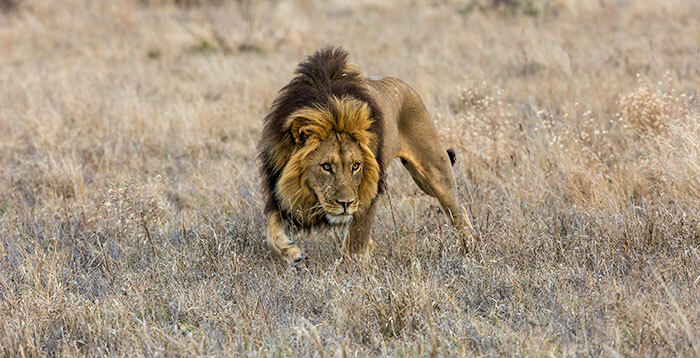 The game is much easier to find and there is often a fair amount of predator action as lions, leopards, cheetahs and hyenas take advantage of zebras, wildebeest and antelope weakened by dwindling grazing. It gets light later so your wake-up calls for the morning drives aren’t as early, allowing you a lie-in. Some places that are unreachable in summer because of the high water levels in the Okavango Delta only open once the water subsides in winter. Bear in mind though, that water levels fluctuate and may drop so low by the end of a long dry winter that water-based activities are not possible. If you are wanting to a multi-day walking safari, opt for winter. Walking during the cooler days will be less exhausting and there will be much less mud about. If you want to combine your safari with climbing Mount Kilimanjaro in Tanzania, winter is a great time to go. Yes, it will be colder but the shale that makes up the summit is far more stable and easier to climb in cooler weather. If you want to go to Victoria Falls, go in the early half of peak season – around June and July - while water levels are still fairly high. As the rains dry up, so do the Falls – by October, the Zambian side is often just disappointing rock face. In peak season, the grass is dry and short, making hunting and stalking easier. This massive Kalahari lion was spotted at Tau Pan in Botswana. High season, as across the world, means higher rates. 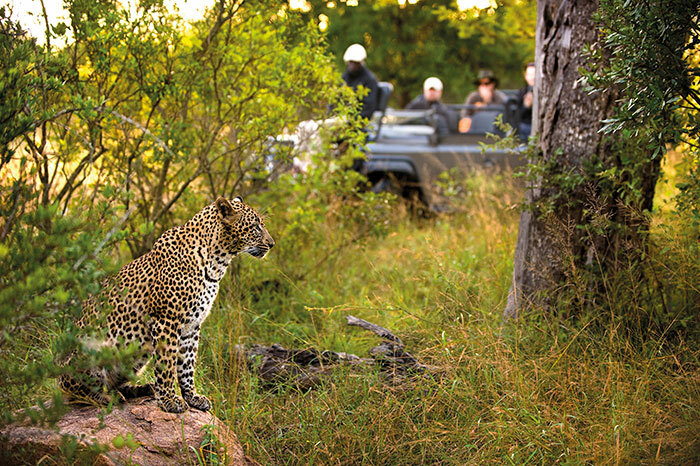 Because peak season coincides with the North American and European summers, demand for accommodation is much higher, meaning you have to make your booking further in advance to ensure your first-choice of lodge or camp (highly sought-after places and events like the Kruger National Park, Okavango Delta and Wildebeest Migration river crossings from the Serengeti into the Masai Mara can be booked out anywhere from nine months to a year in advance). 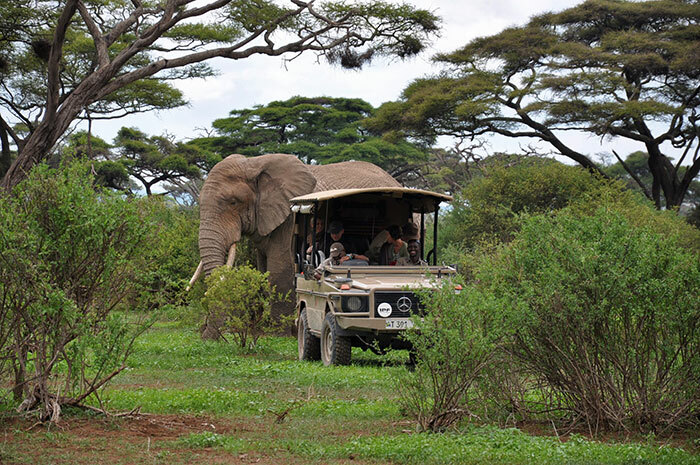 You will generally stay at lodges and camps running at full capacity with game-drive vehicles filled with the maximum number of guests. If you want a more private experience, consider booking at a concession or conservancy. 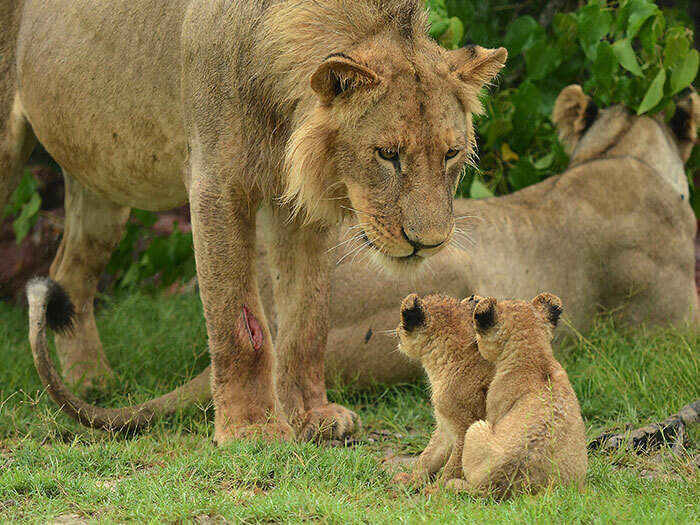 To see our Top 10 private reserves and conservancies and the advantages they offer, please click here. The lack of rain means plenty of dust – not great for those with allergies. If you are a keen photographer, take steps to protect your camera from dust or clean it every evening back at camp. If you want to combine your safari with time in Cape Town, there is good news and bad news. The bad news is, Cape Town has a wet winter and a dry summer, meaning it will be cold and wet in the Mother City if you come during safari peak season. The good news is, there is plenty to see and do here, from world-class restaurants to historic wine estates where you can warm up at a log fire. November rain turns the landscape around Shu’Mata Camp at Kilimanjaro in Tanzania into a feeding ground for wildlife that have survived the dry winter. Africa’s summer runs from about November to April (ie northern hemisphere winter). Most of Africa experiences spring and summer rain, which means lots of water and food for the animals. Although it is the ‘rainy season’, the rain is not constant or monsoon-like. Generally, clouds build up during the day, breaking in the late afternoon for spectacular showers. In the evenings you may experience thunderstorms with plenty of lightning. It will be hot and humid so consider a lodge with air conditioning and a swimming pool (or, even better, a private plunge pool on your room’s deck). The weather is also perfect for using outdoor showers…! Non-negotiables are sunscreen, sunglasses and a hat or cap. The sun is very intense in summer and a bout of sunstroke will ruin your safari. Cotton shorts and T-shirts in neutral colours (greens, greys and browns) will keep you cool. Flip-flops are useful around camp and pack a bathing costume. One pair of trousers and a long-sleeved shirt are recommended for evenings, when mosquitoes are more active (they will bite skin not covered by clothes and avoid black and navy blue, which attract them). Consult your travel clinic about malaria medication regardless of your destination and inform then if you are intending to go scuba diving at a beach or island destination to ensure they prescribe the correct prophylactic. What aren’t they doing? Rain is considered a blessing in Africa, and spring and summer see birds, bees, buffalos and bats taking full advantage of the abundance of food and water. Migratory birds return, frogs and some reptiles re-emerge and, of course, insects hatch from the larval stage. The absolute highlight of low or green season is the birth of babies – foals, calves, puppies, piglets and cubs are all born or venture out from their dens to make sense of this verdant new world around them. Expect wobbly zebras, clumsy giraffes, squeaking jackals and playful warthogs. There is a serious caveat: predators pick off the weakest first, which could be a baby. Expect heart-wrenching scenes like a massive croc inching towards a baby hippo as its mom positions herself between them, or a pack of wild dogs separating a confused and inexperienced newborn impala from the rest of the herd. If you’re in Botswana, you may be lucky enough to see the zebra migration through the Savute Channel in about March. By December, the rains should have transformed the once dry, brown landscape into a verdant green. Photographers love this time of year as the animals ‘pop’ against the foliage. Oddly enough, you may not see as many animals even though more are around. This is because the bush springs back to life and thick greenery and vegetation gives them ample hiding places and shade from the sun. The surge in the amount of water available means they can roam much further, secure in the knowledge that they will find something to drink. Waterholes popular in winter may not be as visited in summer. Don’t despair. Good guides relish the challenge of finding game for their guests and often co-operate with each other about sightings. Working harder to track an elusive rhino or follow the spoor of wild dogs just makes it so much more rewarding when you do find them (conversely, birds are much easier to spot so birders will be in their element). 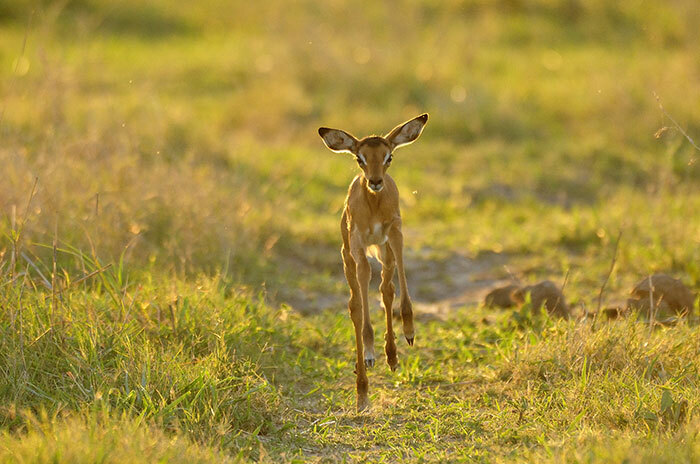 A baby reedbuck gets up to speed on its still-wobbly legs in November around Kwando, a major concession in Botswana. Low season means lower rates, lower visitor numbers, lower vehicle numbers and more choice. You don’t need to book as far in advance and your African Safari Expert may be able to source great deals with top lodges and operators. Sometimes, you may be the only guests at a camp or in a vehicle. Photographers prefer green season because of the sharper colours, clearer air (there is no dust) and return of colourful birds and the birth of babies. As mentioned, the birding is sensational at this time of year. It is much hotter, muddier, wetter and more humid than peak season. There are more bugs around and it is more challenging to find game – but so much more satisfying when you do! Some destinations that receive very high rainfall may be ‘closed’ for the season. Most lodges in Zambia, for example, are closed over March and April with long rains turn the roads into impassable black cotton soil. 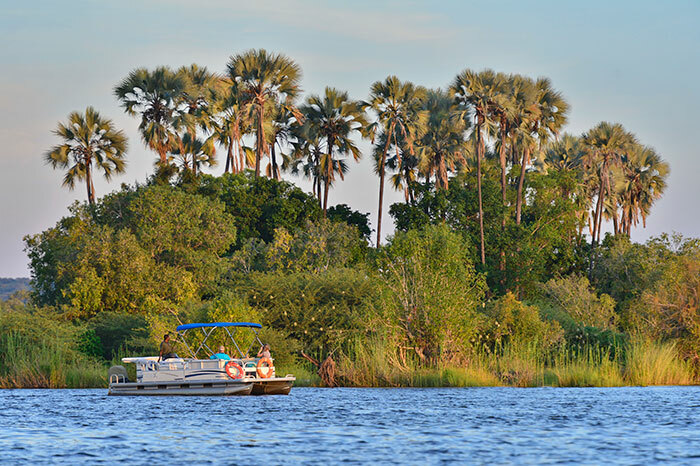 February is a wonderful time of year to be out on a cruise with Victoria Falls River Lodge in Zimbabwe – it’s cooler out on the water during the heat of the afternoon. ‘Shoulder season’ is an industry term to refer to the transitional months between winter and summer, when it’s not quite low season but also not yet truly high season. It may be sunny, it may be rainy, it may be cool – it’s a slightly unpredictable time when the seasons, weather and animals’ behaviour is changing. Some lodges still offer shoulder season rates – which will be higher than Green Season but lower than peak – while others have simplified matters by cutting the year directly in half. Shoulder seasons are traditionally around May and November, and they can be good times to travel as many visitors might be ‘waiting’ for peak season to hit properly before venturing to Africa. When is the Best Time of Year to See Animals? Traditionally, high season is the best time to find the game simply because they’re easier to find with less foliage and water around. But it’s important to remember that the same number of animals are around during low season – they just have more options to drink and feed, so may roam more widely and may be harder to find. Lion Sands near the Kruger National Park is renowned for its leopard sightings – the thinner the grass, the easier it is to find and see them. When is the Best Time of Day to Find Game? 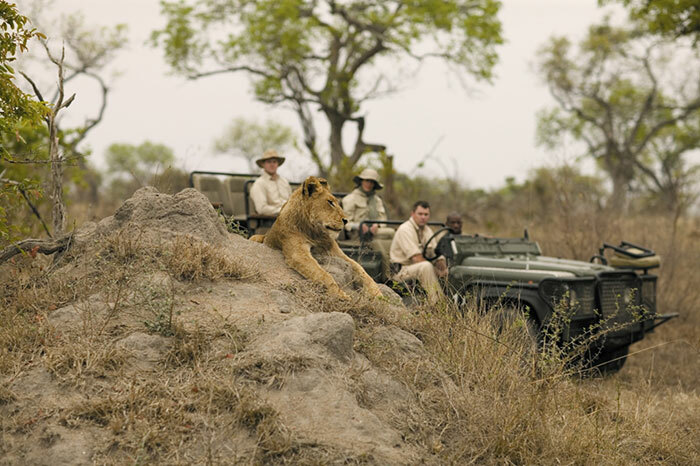 Across all of Africa, the best time to see animals at their most active is early morning and late afternoon. This is because midday is generally very hot and they retreat to the shade of trees, rocks, burrows and nests, which makes them harder to find. Even if you do see them, they are generally conserving their energy and resting quietly. Towards dawn and dusk, however, they make their way to waterholes to drink: in the morning to slake their thirst after a long night and in the afternoon to drink up to survive another night. Lions and leopards hunt most often at night so its important for prey not to have to make themselves vulnerable by heading to waterholes in the dark, where they can be easily ambushed. Moving around in the heat of the day uses a lot of precious energy and so animals are all generally quite quiet then. This is why game drives are universally undertaken at sunrise and towards sunset. 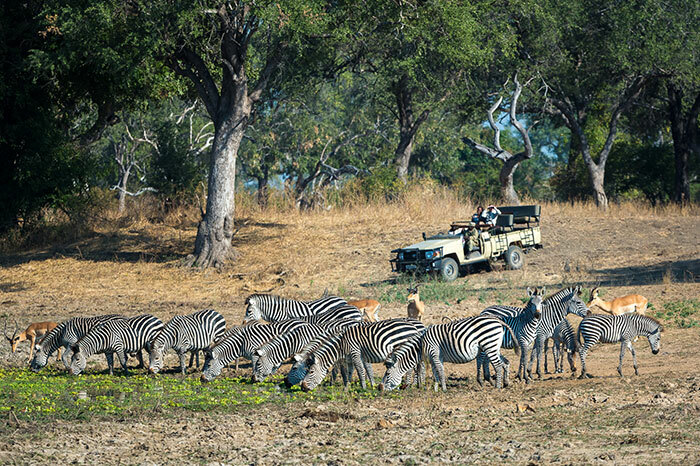 On an ‘all-day game drive’, you will be away from the lodge for the whole day but, like the wildlife, will rest with a picnic lunch during the hottest part of the day. 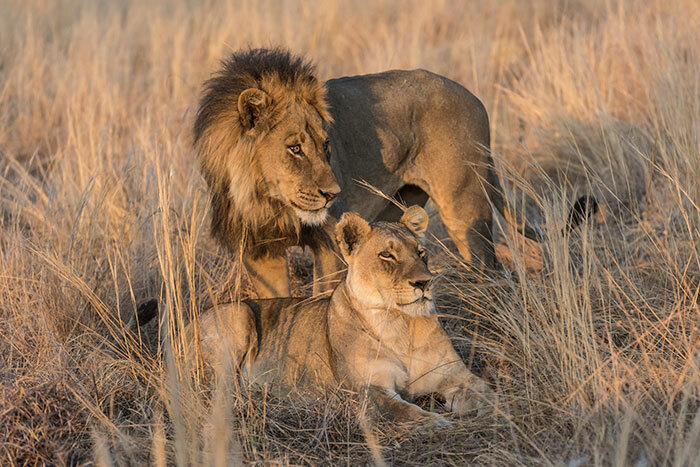 It’s August and the peak-season grass in Botswana perfectly camouflages this magnificent pair at Savuti Bush Camp.